A brilliant story about two boys, their friendship and the power of the imagination. Milo and Jannis accidentally witness an assault on old Geronimo in his scrapyard. Before Geronimo lapses into a coma, he asks the boys to look after iX and the others. But who on earth is iX? And who are the others? With the help of a butterfly and a good deal of courage the boys manage to uncover old Geronimo’s incredible secret and his curious metal beings whose lifeblood is storytelling. 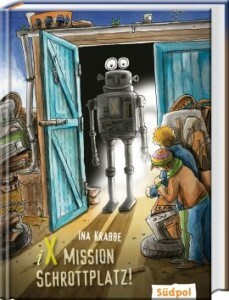 When they find out that the scrapyard is supposed to be razed to the ground, Milo and Jannis concoct a daring plan to save the robots—a gripping read is guaranteed!